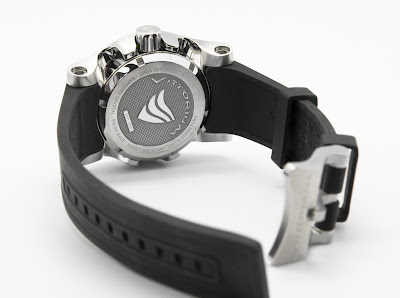 Watchuseek loves dive watches and we had the opportunity to try and test the Vittorium Deepdiver watch. A 47mm sea monster that can be taken to depths of 200 meters without malfunctioning. We have to be honest that we've seen watches that made us more enthusiastic, but never judge a book by its cover of course. 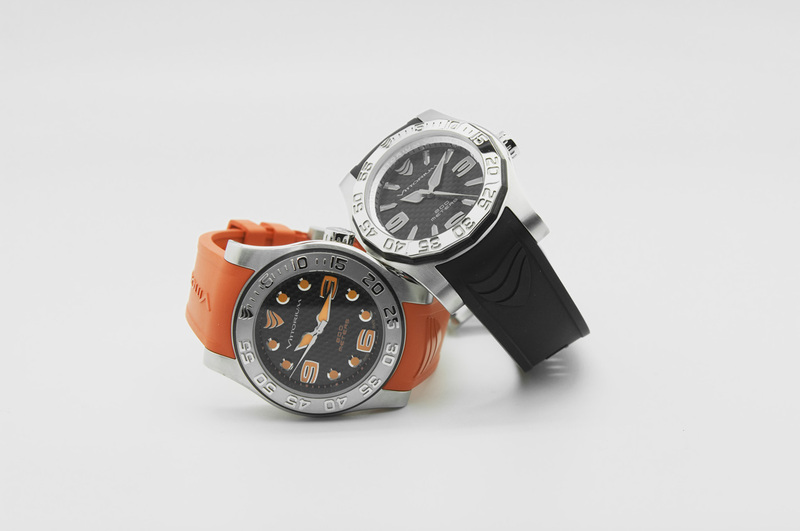 However, the design of the Deepdiver is a bit too fashionable for us watch aficionados. The large hands and hour markers are probably enhancing visibility below sea level, but seem to be a bit 'too much' using on land. Vittorium's website mentions a few words about wearing the DeepDiver ".....to attend a business meeting, even an important dinner, the Swiss Made DEEPDIVER represents their passion for watches and their elegant status.". To be honest, Vittorium lost us there. It is a diving watch with a fashionable appearance, NEVER wear such a watch during business meetings or an important dinner. You will be completely out of style. Maybe Vittorium should have a word with the head of their marketing department. Anyway, as we continued examining this watch, we did notice the nicely crafted rubber strap and buckle. The rubber strap is long enough for people with large wrists or to wear it over your neoprene diving suit. The buckle ensures a secure fit on your wrist. Available in multiple colors, we had the black and orange version up for review, but since they are technically the same we include them both in this review. Both versions have a carbon looking dial, stressing the sportiveness of the watch. Besides colors and dial lay-out, we also noticed the differences in the bezel design. 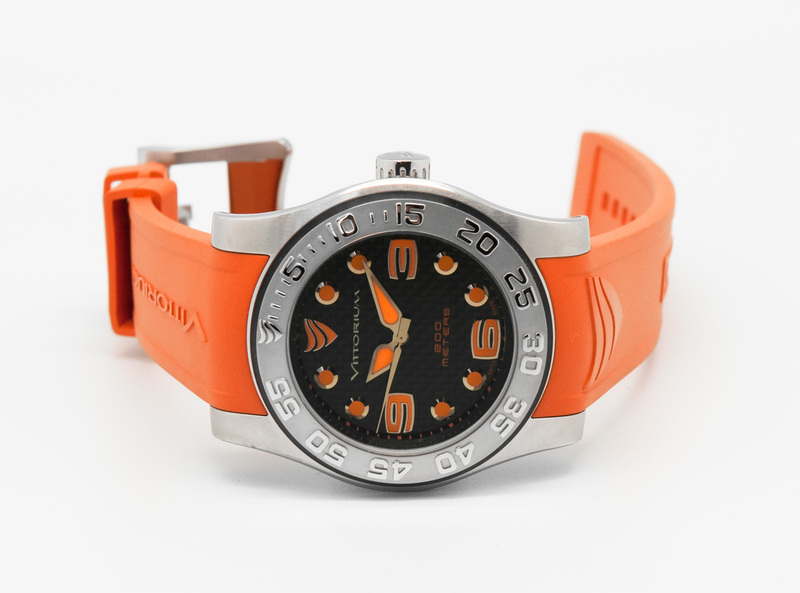 The orange Deepdiver has this 'Yacht-Master'-style bezel with embossed numerals while the black version has these engraved numerals. Our personal preference would definitely be the bezel of the orange version. 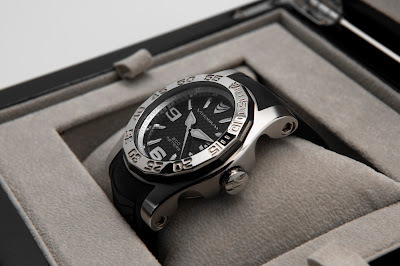 The nicest and perhaps most challenging task for the manufacturer of the Deepdiver was the complex stainless steel case. It looks as if the bezel and lugs are separated from the actual case, which gives the watch an interesting 'extra' dimension. The large screws in the lug are a bit over-done in our opinion, but we guess that there are people out there who will love them for sure. One can doubt the comfort of such a large (47mm) watch, but we've found it to be a pretty decent wearer. 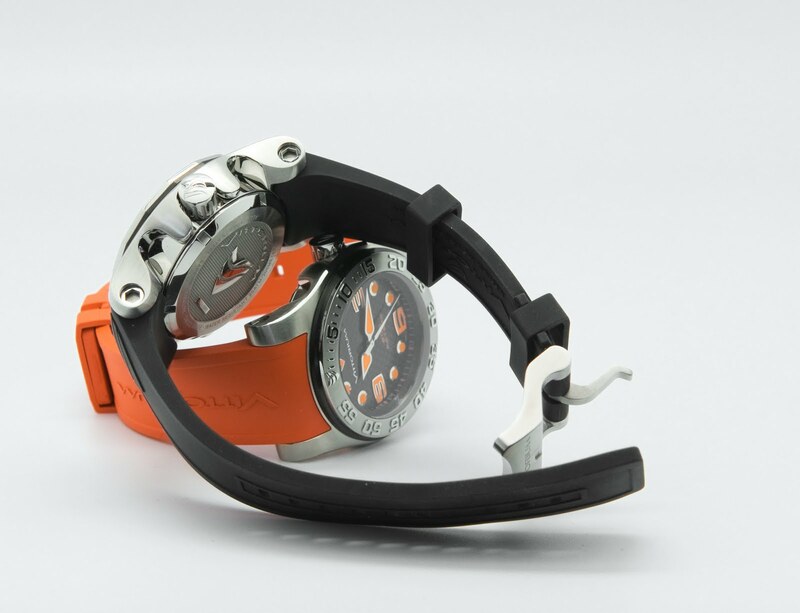 The rubber strap is probably also to thank for this, as it prevents the watch from sliding around your wrist. A stainless steel bracelet would have been a disaster, aside from the total weight. The watch comes in a nice presentation box, for what it's worth of course. We did not receive any booklets or paper work with the watch, so we can't be certain there aren't any. Inside, a quartz movement (ETA caliber F:06) is ticking with the utmost accuracy, but it does confirm our feeling that this is more of a fashion watch than a watch for aficionados. With a price tag of $895,- it should be possible to use a nice but simple automatic movement, which would at least attract a whole new group of people to the Deepdiver. Besides watches, Vittorium manufacturers silk scarves and cuff links. We'd rather see them invest in the pointers given above to become an interesting brand for people who look further than a nice design and bright dials and colors. We feel that with their complex cases and comfortable rubber straps, Vittorium has a great concept in their hands but needs to be fine-tuned for the typical reader of Watchuseek.